There’s a nifty throwaway feature in Capcom’s brand-new remake of the survival-horror classic Resident Evil 2. At any point throughout the campaign, you can go to the settings menu and toggle to the original game’s audio. Not the exact same audio, of course—there’s no way to make the monsters sound like they did in 1998, nor has anyone painstakingly dubbed the old and famously stilted dialogue (“Sorry, but it looks like your party has been canceled”) into the new cutscenes. But switching on this sonic way-back machine does revert many of the basic sound effects to their 20-year-old “glory.” Typewriters log your save game with a familiar clickety clack. Item boxes creakily groan open, just as they did on the PlayStation 1. Rifling through your inventory will emit an old-school, oddly comforting plink plink plink. And then there’s the music. For a real Pavlovian rush, switch on the throwback audio right before first stepping into the main hall of the game’s primary location, the Raccoon City Police Station. The piano, lonely horns, and dinging bells will take you back to a simpler time of hoarding ink ribbons and pushing around statues. It’s a fun option, but not an essential one. Because even without the vintage audio, Resident Evil 2 is destined to inspire déjà vu. Capcom may have updated the sound, along with the graphics, the combat, and the camera system (it hangs over your shoulder, instead of capturing your plight from fixed and often exaggerated angles), but this is still a very faithful remake, arguably even closer to its source material than the 2002 redo of the first Resident Evil. The bifurcated sci-fi melodrama story, following rookie cop Leon Kennedy and motorcycling civilian Claire Redfield through a city overrun by the living dead, plays out as it always has. And the level design, while tweaked slightly, follows the same basic blueprint, replicating the layout of key locations and the design aesthetic of many rooms, down to the position of furniture. More than that, and as our own Sam Barsanti pointed out in his full review, the values of the original have been preserved: All the modern bells and whistles can’t disguise the familiarity of the core gameplay, with its focus on conserving supplies, avoiding confrontations, and backtracking constantly through enemy territory. All of which makes the souped-up, spit-shined new Resident Evil 2 something of a nostalgia trip, at least for those with fond memories of playing through its iconic inspiration. This critic has made the case, pretty recently, that nostalgia is the enemy of true horror—that the genre, at its most effective, is about discomfort, which is basically the opposite of the warm flood of recognition that fan service provides. Can you really scare someone when you’re constantly feeding them what they already know and love? Thing is, this RE2 does more than provoke nostalgia. It weaponizes it, through deviations in gameplay—through the ways, big and small, it actually breaks with its predecessor. Because everything is so eerily similar, you think you know how to handle it. But that false sense of security can get you into trouble quick. Take the zombies. Against all odds, Resident Evil 2 makes the most played-out of monsters, dispatched with often-comical ease on television’s reigning but waning cable blockbuster, scary again. It’s not just that they move more erratically and unpredictably than any that have shambled their way through a previous Resident Evil installment, or they just sound more fearsome, rasping hungrily as you bolt around a blind corner into their clammy embrace. It’s also that the standard RE rules—and indeed, what we’ve all come to understand as the accepted rules of zombie maintenance—no longer apply. Shoot one of these disgusting ghouls in the noggin and they’re likely to keep coming; the headshot is no longer an instant kill. Get grabbed by one on the ground you’ve neglected to finish off and you won’t take a little damage before getting the job done with a decapitating kick—that’d be too easy! And you think running away will save you? The zombies will often follow you up stairs or through closed doors, breaking the established leash this franchise used to attach to them. This isn’t the first time Capcom has diabolically toyed with its audience’s presumed experience taking down the undead. The aforementioned Resident Evil remake introduced an ingenious re-reanimation system, wherein zombies you left for dead would rise again, faster and stronger and more ferocious than before. And one could argue that part of the kick of 2005’s white-knuckle-intense Resident Evil 4 is how it made you adjust, on the life-or-death fly, to infected hordes that behaved very differently than the kind that the series built its legacy atop. The new Resident Evil 2 pushes those subversions of gameplay memory further, sometimes cleverly exploiting a fan’s ingrained understanding of the conventions. You can’t reload your weapon in the items menu anymore; it’s now a real-time action, performed with sometimes agonizingly realistic deliberation, each bullet needing to be locked into its own chamber as some beast draws nearer and nearer. Oh, and what of the assumed safety of the save room? Though some of these strategically dispersed checkpoints will indeed function as they always have, like sanctuaries within a house of horror, there’s now no hard guarantee that a room with a typewriter and/or item box will be danger-free. (You can die, in other words, right before saving your progress.) RE2 even expects you to solve puzzles while enemies are afoot. In the most nerve-wracking of these assignments, you’re asked to adjust a series of bookcases to reach a new door—and far from “pausing” itself while you perform the task, the game puts a stomping Tyrant on your tail, forcing you either to multitask and periodically stun him while you finish or to divert him away from the library, throwing him off your scent for long enough to get it done. Speaking of said Tyrant, the relentless campaign of terror waged by Mr. X is perhaps the scariest way Resident Evil 2 twists its own tropes. 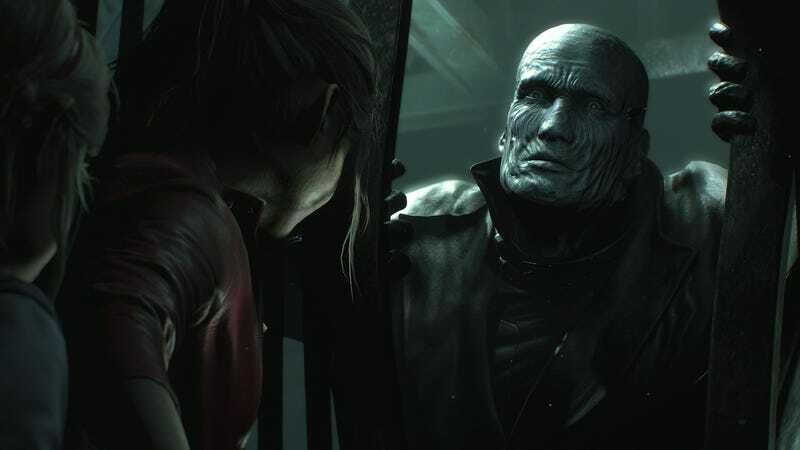 A towering, effectively un-killable behemoth in a trench coat, Mr. X was originally conceived as a way to cruelly bend the rules of Resident Evil—to add a new edge of urgency to a second play-through of the first sequel. Recalling a previous survival-horror stalker (the persistent Scissorman of Clock Tower) and essentially a dry-run to the titular menace of the third Resident Evil game, Nemesis, Mr. X showed up in the B campaign of the original RE2, sometimes literally bursting through the pre-rendered background, as though he were tearing the very fabric of the game’s logic. Unlike other bosses, you couldn’t fell him, no matter how much firepower you were packing. Unlike other enemies, he would actually follow you across the map—though, usually, only down a couple hallways at a time. Without giving the character much of a makeover (he still looks kind of dopey, like the Grey Hulk), 2019’s Resident Evil 2 enhances his fear factor. When he first shows up—right there in the A campaign, casually tossing aside the debris of a helicopter that’s crashed into the side of the station—seasoned Evil players might assume that they can quickly outrun him to safety, getting out of his geographic range of predation by reaching a “neutral” area like the Great Hall. But this version of Mr. X isn’t so easily deterred: He’ll just keep following you, tailing you across the whole of the police station. If you manage to get out of his sightline or reach a room he won’t enter (there are a few, though they’re not exactly marked on the map), Mr. X will start lumbering around the nearby area, searching for you, like the Xenomorph in Alien: Isolation. In a sense, these unscripted patrols are more frightening than having him right on your heels—the pounding footsteps and offscreen sound of doors opening and closing create the anxiety of a chance encounter. They also inject a little spontaneity into a series that’s traditionally, carefully, and rather cinematically curated its scares, down to the exact placement of the camera for maximum atmosphere and dread. Mr. X’s movements turn most of the play-field into a danger zone; you could die almost anywhere or anytime when he’s stomping around. The first RE (and its corresponding remake) took place in a sprawling Gothic mansion in the woods—the kind of place you’d probably expect to find crawling with monsters. Part of the fun of the sequel is how it relocated those same bump-in-the-dark mechanics to the more mundane, municipal backdrop of a small city police station, with cluttered offices and waiting rooms and, okay, the occasional baroque unicorn sculpture. It really ran with the idea of making the familiar frighteningly unfamiliar. The remake builds on that appeal in a metatextual way, not just sharpening the banal realism of the level design—the police station looks more than ever like a real police station, splattered in both stale coffee and spilled blood—but also turning your expectations about how Resident Evil should operate against you. The game could have taken that element further, to be sure: Instead of slavishly recreating some of the original’s most iconic scares, like one involving a two-way mirror and another involving a blind monstrosity skittering across a window, the designers might have really thrown reverence to the wind by not delivering the most expected shocks. But you still have to admire the tightrope Resident Evil 2 walks as an ideal remake, living up to memories of an ancient game even as it effectively reminds you that knowing Raccoon City by heart won’t save you. It might just get you killed, in fact.